The Governments of the Republic of Liberia and Japan on Tuesday, November 6, 2018 signed 2.7million United States Dollars Food Aid Agreement aimed at alleviating hunger and promoting food security in Liberia. The 2.7 million Food Aid Agreement signed is known as the Kennedy Round (KR) of Food Aid 2018. It can be recalled that the Government of the Republic of Japan, in October this year, announced US$2.7 million worth of Food Assistance to the Government and people of Liberia aimed at addressing Liberia’s food security situation. The disclosure was made by the Japanese Foreign Minister His Excellency Mr. Taro Kono when he held a bilateral meeting with Liberia’s Foreign Minister His Excellency Gbehzohngar M. Findley at his Foreign Ministry office in Tokyo, Japan. Japanese Foreign Minister Taro Kono told his Liberian counterpart that his government is intensifying efforts aimed at elevating Japan-Liberia bilateral relations. The recent Agreement was signed in the Minister’s Conference Room on the 4th floor of the Foreign Ministry. According to a Foreign Ministry release Liberia’s Foreign Minister Gbehzohngar Milton Findley signed on behalf of Liberia, while Japanese Ambassador accredited to Liberia, H.E. Tsutomu Himeno Signed for his government. In Brief remarks after the signing, Japanese Ambassador to Liberia, Tsutomu Himeno expressed confidence that the 2.7 Million Food Aid Grant will contribute to the social and economic development of Liberia Ambassador Tsutomu Himeno emphasized that Japan and Liberia have had cordial bilateral relationship over the years. He extolled President George Manneh Weah and his government for working hard to promote the country’s Pro Poor Agenda. Ambassador Tsutomu Himeno then expressed his Government’s willingness to contribute to Liberia’s development initiatives through joint efforts of the two countries. For his part, Liberia’s Foreign Minister Gbehzohngar Milton Findley lauded the Japanese for their continuous support to Liberia, stating that the Food Aid Agreement further demonstrates Japan’s commitment to support President Weah’s Pro-Poor Agenda which he said is geared toward improving the living standard of the ordinary Liberian people. 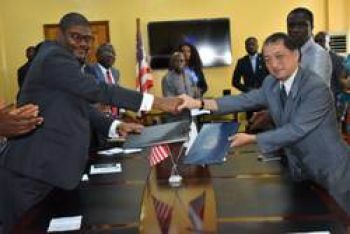 Minister Findley further extended Liberia’s deepest gratitude to the government and people of Japan for the existing cooperation and ties between the two countries. He assured the Japanese Envoy that Liberia and Japan will continue to work together aimed at cementing Liberia-Japan relations for the mutual benefits of their two peoples. Concluding, Foreign Minister Findley said Liberia looks forward to deepening cooperation with Japan, noting that the proceeds from the 2.7 million Food Aid grant will be used to improve the livelihood of Liberians. Also speaking, Assistant Minister for International Cooperation and Economic Integration, Hon. Shedrick Jackson said the funds raised from the food aid donation will be used to sponsor meaningful projects including the pilot seed rice program, the construction of five warehouses and human resource capacity building program at the Ministry of Foreign Affairs Amongst others.